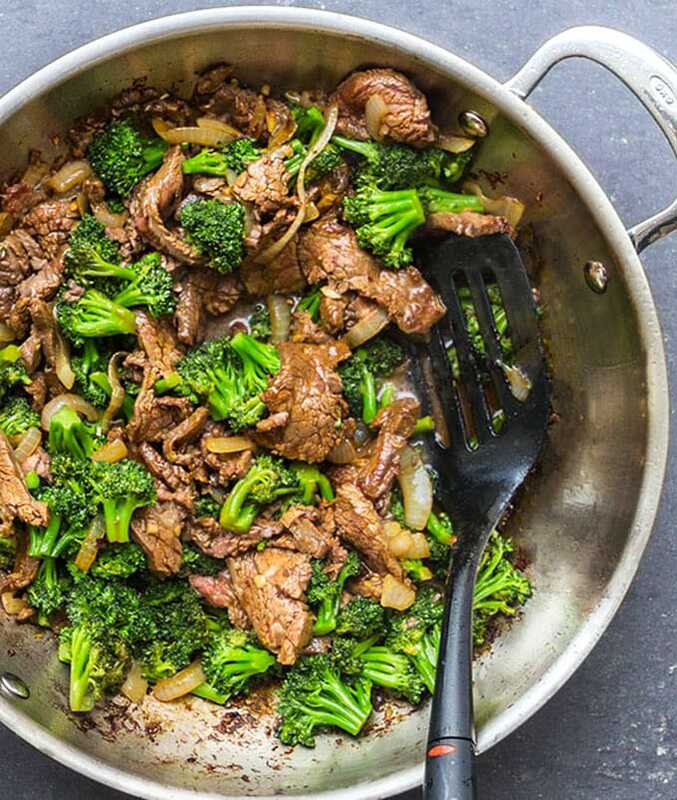 It’s easy to make the most delicious Chinese Beef and Broccoli stir fry at home that’s lighter and healthier than takeout: tender beef, crisp-tender broccoli, delicious sauce. Serve with fluffy white rice. OXO provided a wok in exchange for this post but all opinions are my own, always. It’s funny to reflect on that and think about how discerning (picky? crazy?) I am now, spending days perfecting this recipe, which is largely the same as the one I used to love way back when: onions, garlic, broccoli and beef. I don’t remember when or why my wok disappeared, but I haven’t owned one since the 90’s. So I was extra excited when I was offered the opportunity to test out OXO’s new line of cookware, and one of the options was their Stainless Steel Pro 12 Inch Wok + Cover. Woks are also designed to be tall enough and spacious enough for free and vigorous tossing or “stir-frying,” without things flying out of the pot. The lid is for keeping the steam in. I use it in this recipe to get perfectly crisp-tender broccoli. When we order take-out Chinese food, I always get one of my three favorites: Moo Shu Pork, Chicken and broccoli, or beef and broccoli stir fry. I’m not sure I’ll be ordering in Chinese any time soon. 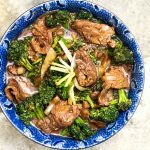 Chinese beef and broccoli stir fry is a favorite Chinese classic and it’s surprisingly easy to make at home. If you’re like me, this recipe will become a regular in your repertoire. 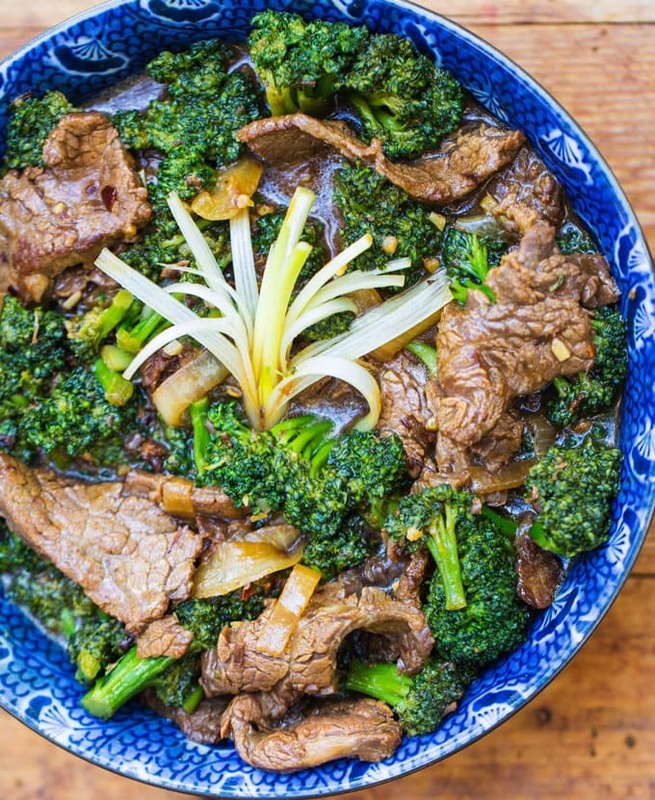 Here’s the Chinese Beef and Broccoli Stir Fry recipe. If you try this, I hope you’ll come back to leave a rating and comment. I’d love to know what you think. 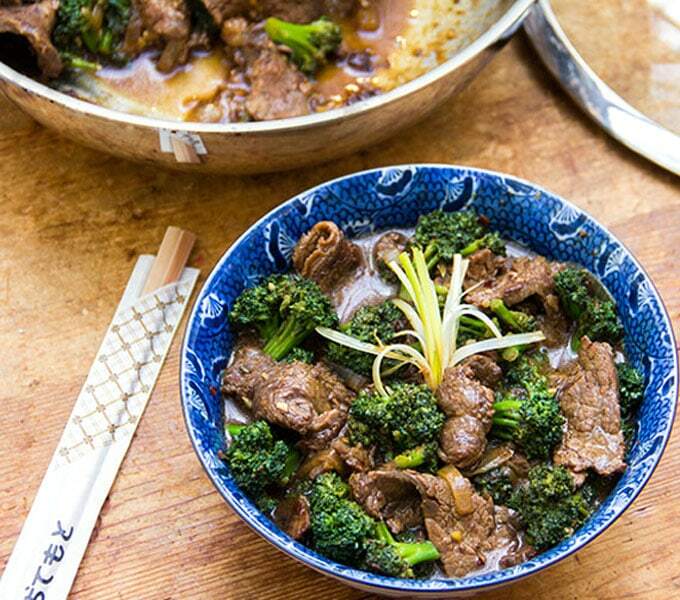 Perfect Chinese Beef and Broccoli – tender beef, crisp-tender broccoli, delicious sauce. Serve with fluffy white rice. 1 pound beef round steak or flank steak, sliced lengthwise into 2 1/2 inch wide pieces and then crosswise (against the grain) into 1/8 inch thick slices. Try freezing the beef for an hour or two to firm it up for easier slicing. 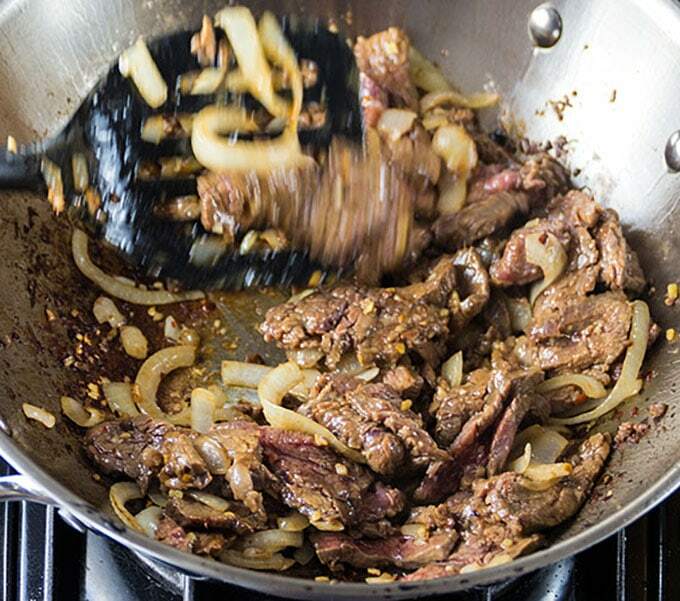 Marinate the Beef: Combine marinade ingredients. Put beef and marinade ingredients into a plastic bag. Massage the meat, through the bag, to coat it with marinade. Press out the air and seal shut. Set aside to marinate for 30 minutes at room temp or up to 24 hours in the fridge. Make the Sauce: Combine sauce ingredients in a small bowl. Set aside. Blanch the Broccoli: Bring a quart of water to a boil in a large saucepan. Add broccoli and leave it for 1 minute. Transfer to a colander. 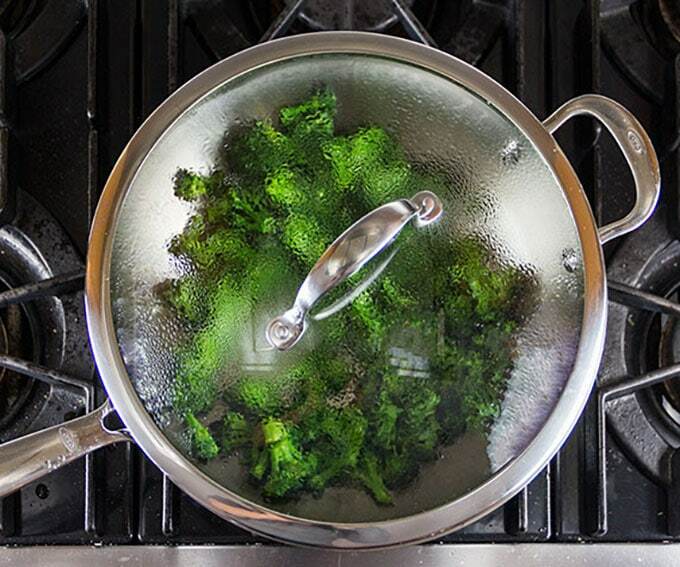 Run cold water over broccoli to stop the cooking process and set aside to drain. 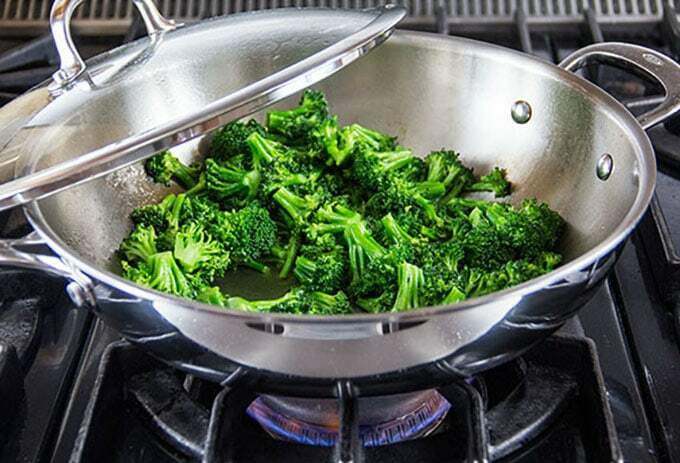 Stir-Fry Broccoli: Heat a wok (or large heavy skillet) over high heat until hot enough to instantly evaporate a drop of water. Add 2 tablespoons oil to the wok and swirl to coat. Reduce heat to medium-high. Add the broccoli and stir-fry for a minute, constantly turning and tossing the florets to sear them and coat them with oil. Lower the heat if they start to burn. 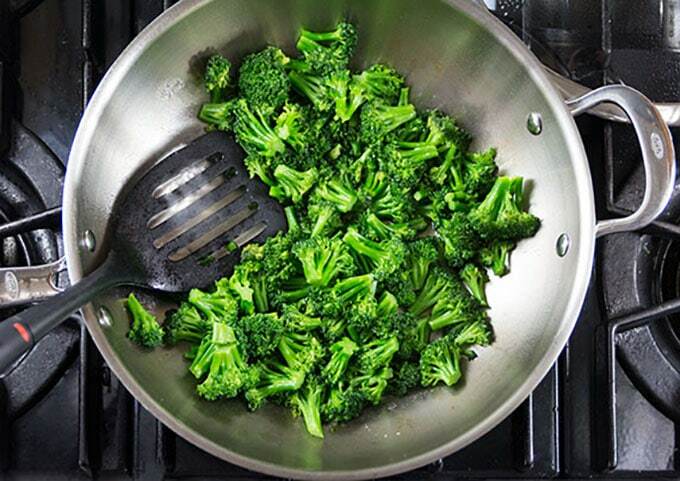 Sprinkle broccoli with 1 teaspoon salt and 1/2 teaspoon sugar. Toss to coat. Add the wine. After it hisses, stir everything around. Add water and bring liquids to a simmer. Cover the wok and let the broccoli steam for about 40 seconds. Remove the cover and scrape broccoli into a large bowl and set aside. Wipe out wok. Stir-Fry Beef and Finish the Dish: Return wok it to high heat. Add 2 tablespoons of oil and swirl to coat. Reduce heat to medium high. Add onion and stir fry for a minute. Add ginger, garlic and red pepper flakes. Stir fry for about 10 seconds, until aromatic. Add beef and stir fry actively, until 90 percent of the pink color is gone, adding more oil, if necessary, to prevent sticking. Give the sauce a stir and pour it into the wok. Toss to combine. 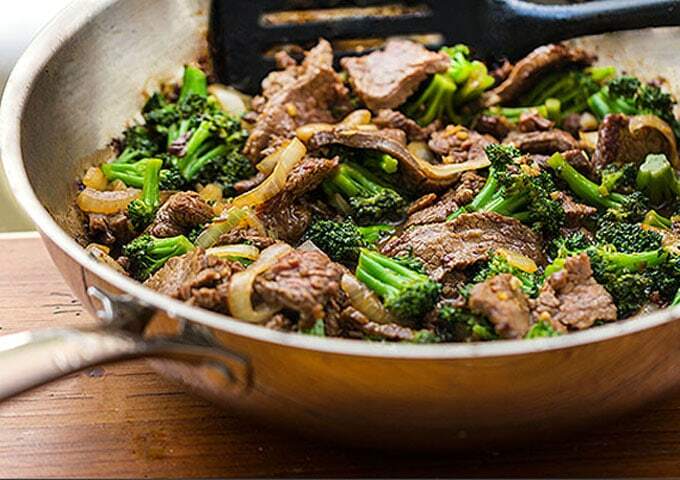 Return the broccoli to the wok and cook, stirring, to reheat the broccoli and finish cooking the beef. Scrape the stir-fry onto a large platter and serve hot, with white rice, if you like. There are affiliate links in this post. When you click on a link to an Amazon product and make a purchase, a small percentage is payed to Panning The Globe, at no cost to you. Your support is greatly appreciated. I made this for dinner tonight Lisa…it was delicious…Mark said this is a “do again dinner”! I cannot get enough of your wonderful recipes!! Thank you for all the hard work you do to keep us all healthy! Can you tell me if you ever provide the nutritional facts with your recipes? I am on a strict diet and need to know caloric and fat intake. Thank you again. Wow, this looks amazing! Can’t wait to make it! Is there a way this could be changed to fit the needs of someone with food allergies? Please let me know, and if so, I would love to use this recipe in my food blog, Cooking Reaction, provided we had your permission first. Hi Becca, Thanks so much for inquiring – yes, you can definitely tweak this to make it allergy-friendly. Here are my recommendations: Gluten-free soy sauce, gluten-free hoisin sauce, Canola or grape seed oil instead of peanut oil. Sesame oil is an allergen for a very small percentage of people, so if it’s a problem, leave it out. There really is no flavor substitute that I know of, but The dish will still be great without it! I hope that helps. Love this recipe, can’t wait to try it. My kids, however, are huge fans of chicken and broccoli. Any way you could share a recipe for chicken and broccoli as well please? Thanks Jennifer! I love chicken and broccoli too! I’m going to do some recipe testing – I’ll let you know when I come up with something excellent and blog-worthy! Yum! This stir fry and a bowl of white rice would make me a happy girl. Your recipe looks delicious! Your recipe sounds yummy and easy, but I can’t help but notice the brown sugar ingredient. Do traditional Chinese really utilize this in their cooking or is this an Americanized version? Hi Alina. Great question! Sugar, is an essential ingredient in traditional Chinese cooking – not to make things sweet, but to achieve the necessary balance of seasonings. Chinese food that is made without at least a small amount of sugar is considered imbalanced. The “Five Flavors” have to all be present in every dish to achieve harmony: sour, sweet, bitter, hot and salty. Brown sugar is commonly used. No wonder you didn’t cook much if Silver Palate was just down the street! And this is so much better than takeout and I bet you can throw it together quicker than getting it at the takeout! Will try the beef and broccoli as I do a lot of stir fry and it sounds good. A little different marinade than mine.